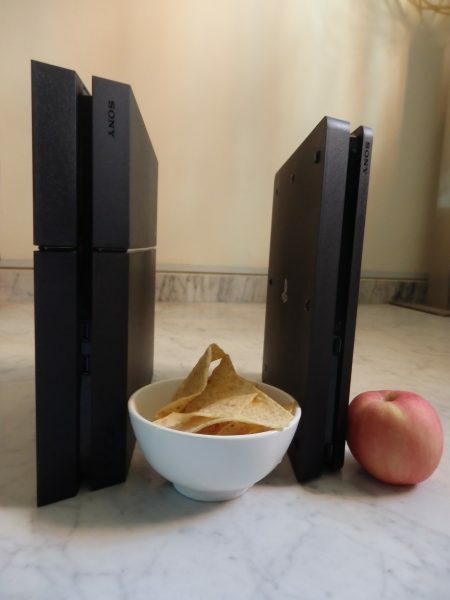 The slim PS4 with a healthier eating option (right) next to its chunkier predecessor. 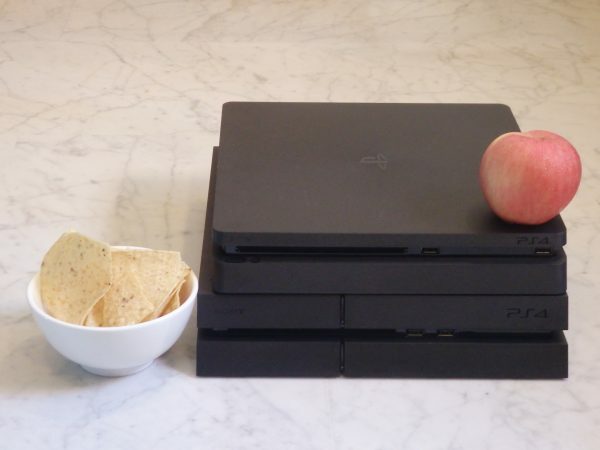 Everyone wants to be slimmer, even the PlayStation 4 (PS4). The newly released version of Sony’s game console features a thinner and lighter body. It weighs in at 2.1kg compared to the 2.6kg of the original version, and is 30 per cent smaller in volume with dimensions of around 265 × 39 × 288 mm. Not to be confused with the upcoming PS4 Pro to be launched in November with beefier specs and 4K display support, this version of PS4 (slimmer and non-Pro) has the same specs as the PS4 already in the market but with a smaller form factor and some cosmetic enhancements. Smaller and lighter, the new PS4 features mostly cosmetic enhancements. Sporting a soft matte look and a more elegant design, the slim PS4 is undeniably more attractive standing up or lying down next to its predecessor. Buttons on the console are also better placed – I have always found the two buttons on the older PS4 rather confusing and kept mixing up the eject disc and power buttons. The new power button with a dotted design is so pretty and the light changes colour too (blue, white and amber). Better button placements and prettier buttons too! After shedding about 500 grams, the slim PS4 is much easier to handle – I can comfortably grip it in one hand and lift it up while plugging in the wires with the other. 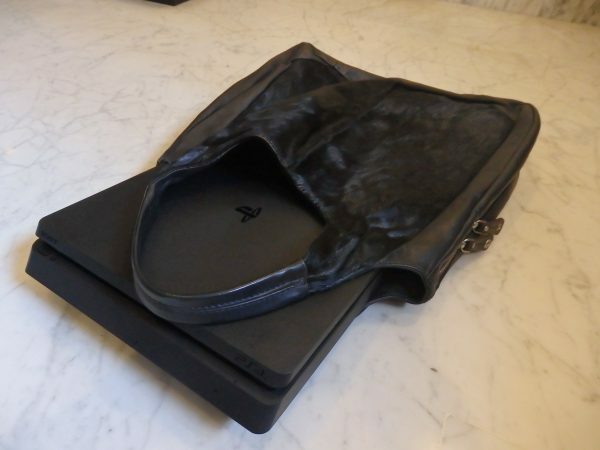 So if you ever need to lug the PS4 around, the slimmer version is definitely a lot more portable. It fits nicely into a tote bag so I can technically bring it out to play at someone else’s home. Your place or mine? With the slimmer and lighter PS4, it’s easy to take it out. I am quite taken by the new controller with a light strip on the touchpad – it’s great for lighting up a dark room. Now you don’t need to tilt the controller upwards to check if its power is running low and if you need to stick the wire in to charge it. The buttons on the controller also feel more elegant to press and less “clicky” than the original. This PS4 runs quieter, so if you have been bothered by the whirring noise of the fan in the first generation PS4, this will be music to your ears. 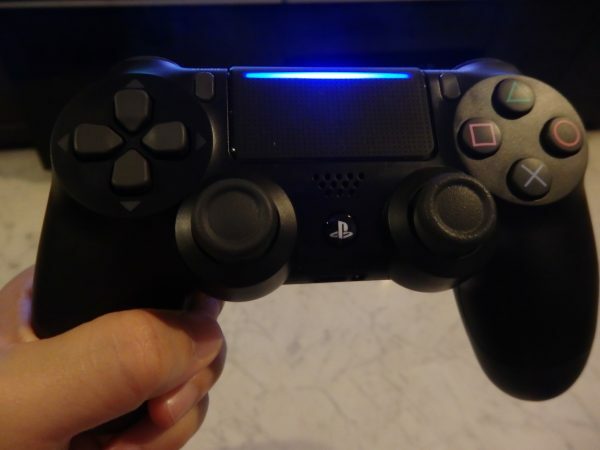 You light up my life – the new PS4 controller features a pretty light strip on the touchpad. The slim PS4 supports high dynamic range (HDR) out of the box, although the 4.0 firmware update would have already given your existing PS4 console HDR support. We can’t enjoy this feature just yet since HDR games are released only later this year. 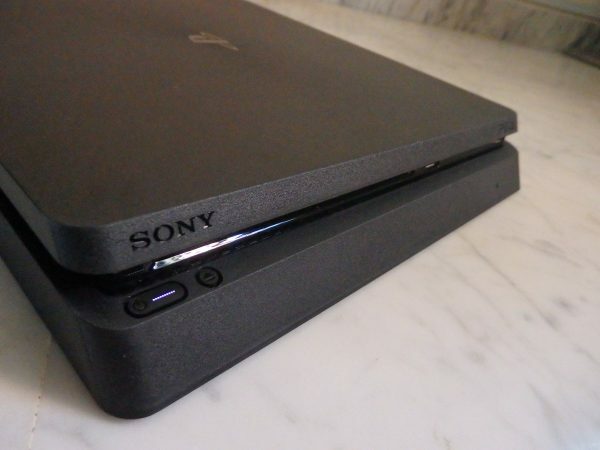 What’s missing from the slim PS4 is the optical out port. 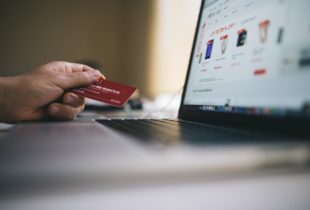 Although most people are likely to rely on the HDMI option for audio, those with a separate audio amplifier or home theatre system might miss having the optical out connection. Who wears it better? 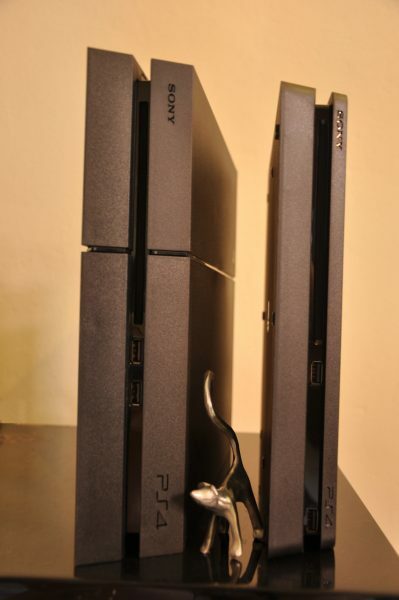 The two PS4 consoles side by side. If you’re hoping for an upgrade in specs and more power under the hood, wait for the PS4 Pro (CUH-7000 series) which will be released on November 10 at S$599. The PS4 Pro sports a better processor and graphics chip, a whopping 1TB of storage and will support 4K displays and content. It isn’t slim though, weighing in weigh in at a hefty 3.3kg. If you want to update your console to a svelte look really fast and need a lighter console, get this slimmer PS4. Otherwise, there isn’t a very compelling reason to buy this right now. The slimmer PS4 retails at S$449 for the 500GB version and S$499 for the 1TB version. Make sure you are getting the “CUH-2000 series” since they are both still called the PS4. See the shot of the two boxes side by side below to help you differentiate between the two. For just the new and prettier Dualshock 4 controller with the mesmerising light strip, you can get it at S$69.90. 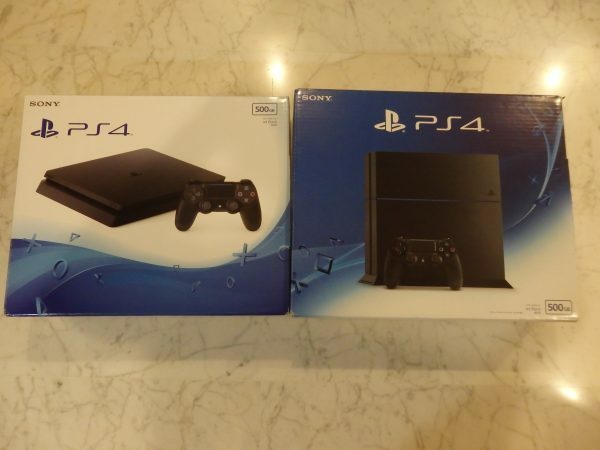 The slim PS4 box (left) versus its not-so-slim predecessor.